This is truly one of the most unique courses in all of golf. First, it is designed by golf's most celebrated course designer, Robert Trent Jones. 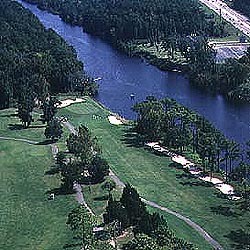 Second, the only access to this 27-hole golf preserve is by glass-enclosed cable car across the Intracoastal Waterway. Once you touch down, you'll find it is one of the most tranquil and unspoiled settings you've ever encountered. The layout is "classic" Jones, with strategic landing areas, crowned greens and superb bunkering. The three nines -- The Lakes, The Oaks and The Ravine -- each possess their own individual character. Take your time and savor every moment, and if you finish early you may be able to catch another round for cart fee only.